What’s better than a fine American made leather belt? A quality American-Made leather belt with a matching buckle! 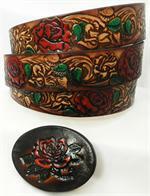 At Gavere Leather we have a variety of tooled leather belts and matching buckle sets. They include one belt and a matching belt buckle. Choose from various designs including an eagle belt with matching eagle belt buckle, a cross belt with a matching tooled leather belt buckle, a deer belt and buckle set, a classic western rose designed set, and more. 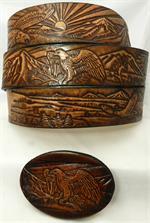 We even have the finest cowboy belt buckles like our Texas belt and buckle set and our carved western set. Each belt undergoes our exclusive 16 step finishing process to ensure a flawless finish. Each belt comes with durable snaps for ease of use, a standard utility buckle, a leather keeper for convenience! For more info about how to measure for a new belt, please read our How to Measure Guide.